Graves in the ancient Safed cemetery can be traced back to the latter centuries of the B.C.E. era and the early centuries of the Common Era. According to Safed tradition Hannah and her Seven Sons, murdered by the Hellenistic ruler Antiochus during the Maccabean revolt, are buried in the Safed cemetery. Other ancient graves include that of Hosea the Prophet and Rabbi Pinchas Ben Yair, son-in-law or father-in-law of the great Kabbalist Rabbi Shimon Bar Yochai. Recently a grave has been found which is believed to be that of the 12th century Biblical commentary Ibn Ezra. During the 16th century many of the great scholars and Kabbalistic rabbis of the era settled in Safed with their families along with other Jews who had fled the Spanish Inquisition. These great scholars include the great ARI, Rabbi Isaac Luria, along with Rabbi Yosef Caro, Rabbi Moshe Alsheich, Rabbi Shlomo Alkabetz, Rabbi Chaim Vital and others. Their graves are situated throughout the old section of the cemetery and tens of thousands of pilgrims visit the graves yearly to pray and ask for Divine Intervention for issues in their personal lives and for the redemption of the entire Jewish World. The Safed Cemetery is located directly below the Old Jewish Quarter of Safed. It is accessible by either of 2 paths that descend from the Old City, one that is located below the Ari Sepharadi Synagogue and the second which extends from the Military Cemetery. The cemetery is a four hour walk across the valley -- Wadi Amud -- from Mt. 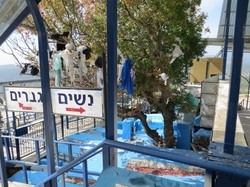 Meron where Rabbi Shimon Bar Yochai is buried. Today the Hekdesh Tzfat, under the authority of the Tzfat Rabbinical Council, cares for the cemetery and the graves. They can also often help people locate gravesites of family members.